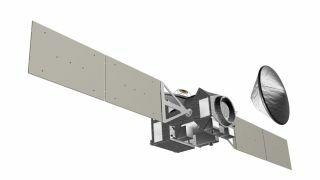 An artist's impression of the ESA/NASA ExoMars Trace Gas Orbiter. The orbiter will carry a European entry, descent and landing demonstrator vehicle. The firstjoint U.S.-European mission to Mars now has a plan for its toolkit. Scheduledfor launch in 2016, the ExoMars Trace Gas Orbiter will study thechemicalcomposition of Mars'atmosphere with a suite of instruments specially suited tothe task. Theseinstruments are expected to take measurements 1,000 timesmore sensitive thanthose by previous Mars orbiters. "Tofully explore Mars, we want to marshal all the talents we can onEarth," saidEuropean Space Agency scientist David Southwood. Twospectrometersthat will detect very low concentrations of molecules and map theirlocationson the planet's surface. Aninfrared-sensitiveradiometer that will continuously measure dust, water and chemicals intheatmosphere as a basis for the spectrometric data. One camera thatwill provide 4-color simultaneous images of a 5.3-mile (8.5-kilometer)chunk ofspace, and another that will provide wide-angle images of the entireplanet, acrossa range of wavelengths of light, to support the other instruments. Travelingaround Mars in a circular path, the ExoMars spacecraft will recordspectra ofthe sun as its telescope picks up the light that reaches it throughorbitalsunrise and sunset. Depending on the composition of gas in theatmosphere,sunlight will pass through it differently. "If youtake the spectra fast," said NASA Jet Propulsion Laboratory researcherGeoffrey Toon, "you can measure the gas abundance at many differentheights above the planet ? 70 measurements as the sun rises, and 70 asit sets." The study oftrace gases, especially methane, follows a general quest to determinetheplanet's status as a potential habitat for past or present organisms. "We gotour first sniff of the gas with Mars Express in 2003; NASA has sinceclearlyconfirmed this," said Southwood, ESA's director of science and roboticexploration. "Mapping methane allows us to investigate further that most importantofquestions: Is Mars a living planet, and if not, can or will it becomeso in thefuture?? Methane isreleased in bothbiological and geological processes, said CaliforniaInstitute ofTechnology researcher Paul Wennberg. Figuring out where Mars' methanecomesfrom will help scientists better understand the history of the planet. Theorbiter's prime spectrometer, MATMOS (short for Mars Atmospheric TraceMoleculeOccultation Spectrometer), will be sensitive enough to detectconcentrations ofgas down to parts per trillion ? so if just a few molecules of methanearehiding among 1 trillion molecules of other gases in the atmosphere,thisinstrument will be able to sniff them out. "We dida calculation which shows that the microbial community found in threecows?bellies would produce an amount of methane that, in the Marsatmosphere, wouldbe observable by MATMOS," said NASA Jet Propulsion LaboratoryresearcherMark Allen, also at Caltech. Other substancesbeing targeted ? carbon-, sulfur- and nitrogen-containing molecules, aswell assulfur dioxide and hydrogen sulfide ? are similarly "diagnostic ofactivegeological and biogenic activity" said Wennberg, who is the leadresearcher of the MATMOS team. "Independently,NASA and ESA have made amazing discoveries up to this point," said EdWeiler, associate administrator of NASA's Science Mission DirectorateinWashington, D.C. "Working together, we'll reduce duplication of effort,expand our capabilities and see results neither ever could haveachievedalone." In additionto the Trace Gas Orbiter, the 2016 mission will include sending avehicle toconduct observations and experiments on the ground. In 2018, apair of rovers, one European and one American, will take another crackat theMartian surface with a drill and a catching apparatus for bringingsamples back to Earth.